The River Tama, Mt. 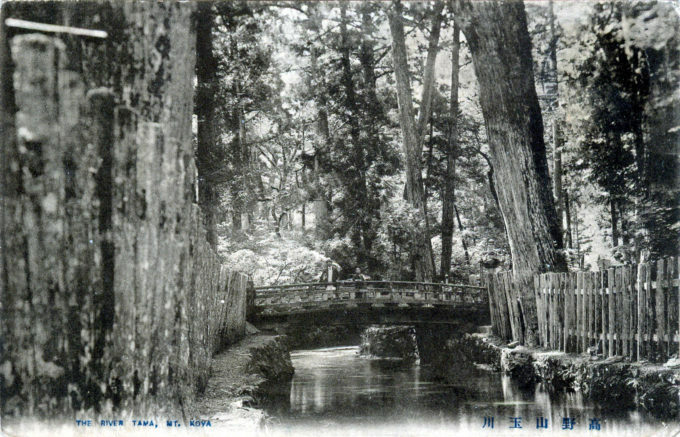 Koya, c. 1920. Ichinohashi Bridge crossing the River Tama, Mt. Koya, c. 1920. This bridge serves as the traditional entrance to Okuno-in Temple up on Mount Koya. Crossing here leads to the largest cemetery in Japan, with over 200,000 tombstones. At the far end of the cemetery complex is the mausoleum of Kobo Daishi, also known as Kukai, who was the founder of the Shingon sect of Buddhism and founder of Mount Koya monastery, or Koya-san, one of the most sacred places in Japan. The site houses over 100 temples nestled in amongst a majestic cedar forest. “During the first half of the walk, beautiful glimpses are obtained from time to time of the Yoshino-gawa flowing far below. There is little or no shade, and the palmettos on the hillsides bear witness to the exceptional warmth of the climate of this district. For the second half, the way leads up amidst magnificent timber, chiefly conifers, to be hold which and to enjoy whose delicious shade and fragrance, would of itself repay the trouble of the expedition. “Most of the finest specimens are Chamsecyparis [cypress]. Strangely enough, but few examples are seen of the species to which Koya-san has given its name — the Eoya-maki (Sciadopytis verticillata). This superb forest, which now belongs no longer to the priests but to the central government, rings with the rhythmic chant of the coolies who laboriously bear down the timber from mountain recesses situated above the monastery.